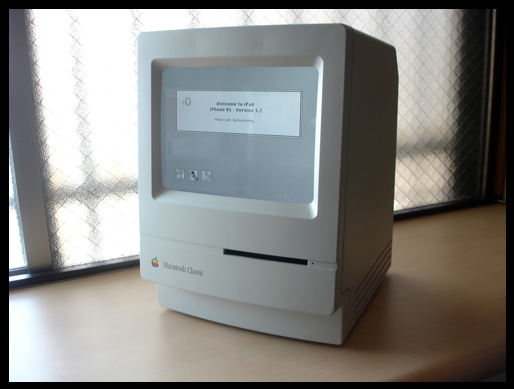 There are a lot of the original Macintosh Classics roaming around the office. Under desks can be found working and non-working the classic hardware. Finally, there appears to be a use for the ones that are not working. Make it into a touch screen color computer… the only thing you have to add is the Apple Bluetooth Keyboard. That is of course assuming you have an iPad, since you are reading a iPad Web site. We found a site from Japan that has a lot of great pictures of what you could build, even a video of it in action. 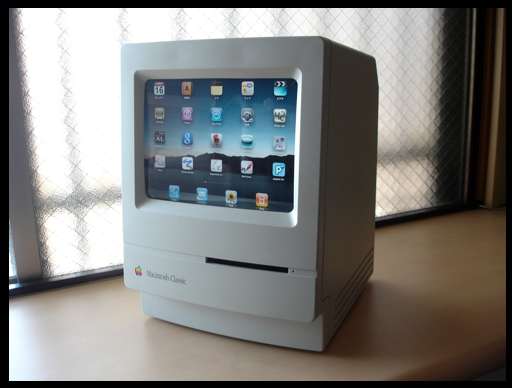 Sadly, there isn’t any good inside shots to assist in setting up the tracks to hold the iPad inside the Classic Mac shell. Fun though! While the creator of the site mentions that the ‘home’ button is blocked, you can do like we do, use the one on the Bluetooth keyboard. Imagine the surprise for people when they walk into your work office or home kitchen and see you taping away on a Classic… uh, Color Classic. Especially since there wont be a wall power cable plugged into the back.